I think this book might have been a much more entertaining read if read when it was first released. 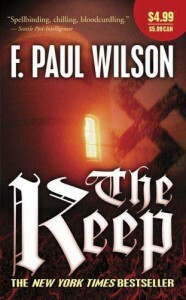 Today, F. Paul Wilson's The Keep feels like a hundred different books I've read. Which isn't to say that this is a bad book. I gave it two stars in accordance to what Goodreads define each star to mean. Two stars is "It was okay". And that's what's wrong with this book. It's just okay. There's nothing great or new here. The characters are all familiar. It is, however, an interesting take on vampire lore, but I will leave that for you to discover for yourself and find out that there is no vampire lore in this book after all, which also works in The Keep's favor, in my opinion.